Scan for malware that may have slipped by your antivirus. This article will focus on step 3, using a program called Malwarebytes. 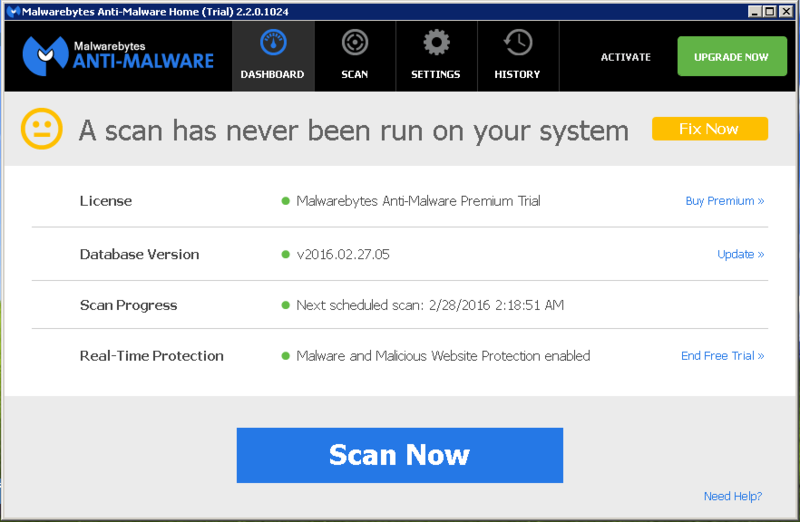 Similar to anti-virus, Malwarebytes is an anti-malware and anti-spyware scanner detects and removes malware like worms, Trojans, rogues, spyware, bots, and more. The free version (allowed for home use only) is different from anti-virus in that it does not continually monitor for malware – it simply is intended for periodic manual scans of an infection. Look for the mbam-setup.exe file in your Downloads folder (or where you saved it). Double-click the file and run the program. Read the instructions to complete the installation. To keep your system running at its best, you should run this scan at least once a month, and immediately following any alerts from your anti-virus of a detection or you find yourself on a questionable website. Before scanning with Malwarebytes, use CCleaner to clear your temporary files and Internet cache (see Part 1 of this article series). The will allow the scan complete much quicker. Before starting the scan, ensure the program and malware database are up-to-date by clicking on the Update link on the right. When everything is up-to-date, click the Scan Now button. This may take awhile to finish. Severe detections will automatically be removed. For less severe threat, you will be prompted to confirm removal. Click the Remove Selected button. It is very important to reboot when prompted when threats are detected.